Some youths of Kabushi Township in Ndola have charged that failure by politicians to deliver on their campaign promises has led to growing levels of voter apathy in recent elections. The youths interviewed have since urged politicians vying for public office in the 2016 elections to ensure that they deliver development and not only concentrate on enriching themselves. 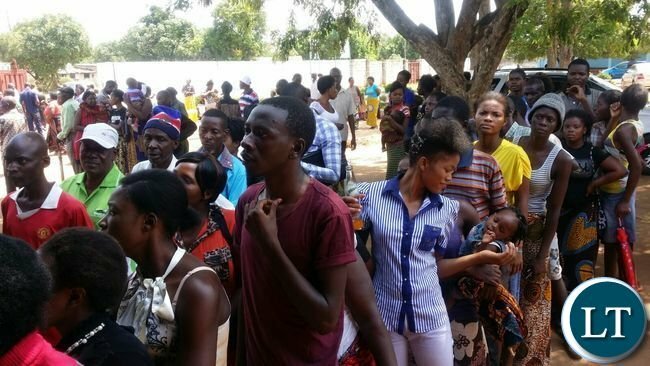 They were speaking yesterday when Kabushi constituency aspiring Member of Parliament Bowman Lusambo conducted a voter registration mobilisation exercise in the area which saw hundreds of young people register as first time voters. The youths were drawn from various wards in the constituency and were ferried to registration centres by the Bowman Lusambo 2016 campaign team. ‘What is missing are leaders that will remain loyal to the people. In Kabushi, we have had MP’s who have abandoned us the moment they stepped into Parliament, this is why we need a change in 2016,’ Rhoda Mulenga said. Another youth identified as Peter Phiri commended Mr Lusambo for the projects he has initiated and implemented since declaring his intentions to stand as are MP. ‘With Bowman, we have seen action and this is why we are calling him Man of Action because everything he has promised, he has delivered. He has sunk boreholes, he had cleared garbage and the drainage system in Kabushi, he has organised a football tournament and he is rehabilitating markets in Kabushi, that is serious action,’ Phiri said. He said Mr Lusambo has demonstrated that he is running for Kabushi because he wants to provide servant leadership for the people. ‘He is using his own resources to develop Kabushi and he is working with everyone across party lines which is commendable. We know that once we give him a mandate to represent us in parliament, he will do even more,’ he said. Bowman Lusambo is working hard to be elected and yet he goes accusing UPND of being desperate. How hypocritical!!! I hope these youths do a don’t kubeba on him.